Properties in Placerville average 4.8 out of 5 stars. Property 10: 'Avery House' Pollock Pines Cottage w/Hot Tub! Property 11: Rustic Pollock Pines Cabin w/Large Deck Near Lake! Property 16: Lagunita- lakeside cabin w/ 2 bunkhouses & HOT TUB! $225..Per night for all 3!! Property 20: Luxury Cabin In The Gold Country Close To Wineries, Old Town Placerville. Property 24: NEW! 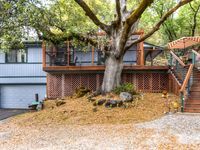 Cozy El Dorado County Cabin w/ Loft & Deck! Property 26: Cabin in the woods with a million-dollar view!